The Hoka One One Cavu was extremely comfortable on cement and asphalt, said a reviewer. Others echoed this opinion by saying it was comfortable right out of the box. The upper wraps the foot fantastically, a runner expressed. Another mentioned that it felt like a slipper. Some buyers praised the snug support that came from the heel collar. The shoe performed well on speed work, slope runs, and sprints, a user remarked. One runner experienced consistent cushioning no matter the distance. A number of wearers were amazed at how the shoe remedied their plantar fasciitis. The shoe helped relieve knee pain that was previously present during running, according to a purchaser. Others also reported a decrease in similar body pains with the Cavu, which were usually caused by wearing the wrong footwear. The dual-density midsole brought terrific back comfort, according to a customer. A few buyers thought that the shoe ran big. The collar rubbed excessively against the ankle, a user observed. A wearer complained that the fit of the pair they bought was different from one another. The Hoka One One Cavu is a newcomer in road running yet it has won over many consumers, based on the considerable number of compliments it received. The shoe’s fit, comfort level, and performance were all appreciated as well. The very minimal criticism was only towards some of the structural components. Overall, the Cavu has been regarded by the majority as a shoe that is worth giving a try. In the past few months, I have been using for road running a new pair of shoes — my first pair from Hoka One One brand, and more precisely, the Cavu model. Since I saw the model the first time, it had something that made me want to give a try. Normally, for road running, I have been using Asics GT2000 which is an overall good shoe, but I was looking for something a bit lighter. Also, I wanted to taste the Hoka brand for the first time as I have heard and read so much about their shoes, but some part of me had remained a bit skeptical. So I better try by myself. Here it is right after I got the box and did a small unboxing at my office desk. Size US11 came in perfect fit. I did almost buy half size bigger, but I made the right choice with the size, no doubt. I like the color combination, not too flashy and with two main colors. 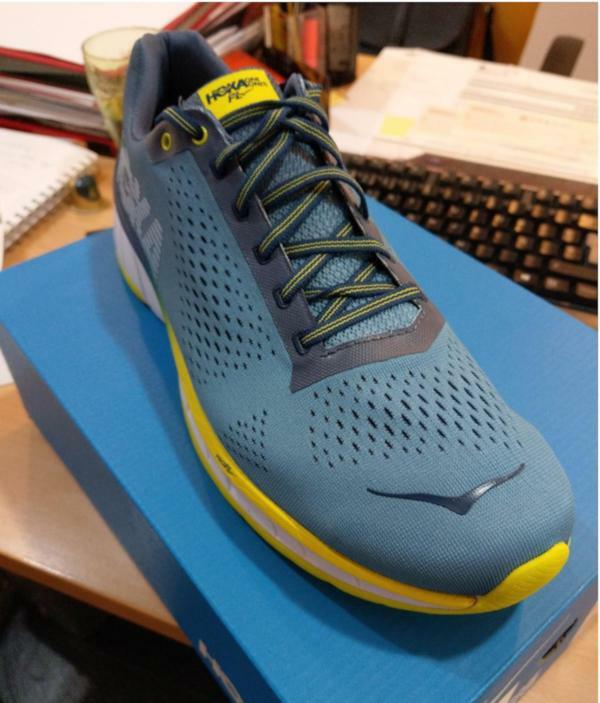 Maybe one thing I didn´t like from other Hoka models is the color combination or a bit the design. With the Cavu, I am more than happy since I opened the box for the first time. It also doesn´t look too bulky which was one of my concerns before buying them. Just after I finished one of my morning runs. You can tell the upper is a bit wet from sweat. They are really fast to dry also. It is very roomy inside, and the material is kind of stretchy. You will not feel any tight inside, and your toes will be able to move without a problem. In terms of breathability, I think is fair and I don´t feel my feet overheat too much. True thing, I haven´t tested them yet during the summer days. But now as we have reached the spring, it would be a good chance to see how they behave with more heat. It has a quite reasonable 5mm drop. And for being a Hoka shoe, you can expect the amount of cushioning is one of the signatures. It doesn´t feel too soft but maybe kind of stiff. Just a matter of putting a bit more miles into them to make sure you feel comfortable. After using them for almost 300km, I can say that the sole is behaving quite good. I do expect they can last for 600-800km range which is quite acceptable. I normally use them for fast workouts involving some tempo or sprint reps, so at least twice a week. Classic laces with enough length, so make sure you make a double knot. They will stay in place and making sure your feet stay locked. They don´t feel tight at all, and that´s a good thing. These are not my only road running shoes but have become my main ones. I like how light they are and especially how responsive too. Initially, the sole may look like a bit stiff, but once you get warmed up and increasing your pace, they are really comfortable to run. If you are looking to jump into the Hoka wagon, I think the Cavu is a really good choice. I bet for the Cavu 2 they have improved it even more, so you better check them out or get these at a discount price while you can. Hoka, you did a very great job. I am a super fan of the Cavu. This shoe didn’t feel like some of my other Hoka’s. This shoe was lightweight and the sole didn’t feel oversized like some of their other models. This felt like a normal running shoe that was lightweight with a sock-like fit. The new Cavu is a great option for tempo runs or shorter races with a similar fit and feel of the legendary Hoka Clayton. The Hoka One One Cavu claims to be a versatile runner that aims for a simplistic yet bold appearance, as it presents a lightweight construction with functional technologies beneath. Borrowing the name from an acronym related to aviation, the Cavu delivers a clear and unrestricted performance on the road, track, or gym. An open-engineered mesh and a Lycra® bootie work together to bring a breathable upper with a seamless fit. Both features promise to equip the foot with a comfortable and customized hold. At the midsole resides the brand’s proprietary cushioning, PROFLY™, which offers a balance of propulsion and protection through its unique layout. Correspondingly, the outsole uses RMAT® for a soft and featherweight ground contact. The Cavu from Hoka One One runs true to size. It has a modest construction from forefoot to the heel, giving a snug and secure fit to runners with a low to average foot volume. This shoe is available in medium width for both the men’s and women’s versions. The zonal RMAT® is the brand’s exclusive outsole material. It works by enabling a guided stability and durability in high-wear areas. RMAT® is a unique blend of rubber and foam, thus getting the best of both worlds. The created material has high elasticity and therefore yields greater rebound levels than just foam alone. Aside from that, the combination results in an ultra-sticky grip, as it is able to latch onto angled, wet, and uneven surfaces. Acting as both a design and function, the wishbone pattern of the outsole doubles as the flex grooves. This layout offers strategic flex points, resulting in a smooth transition. A dual-density midsole, called the PROFLY™ is present in the Hoka One One Cavu. It features a construction that is soft in the heel and firm in the forefoot so that the runner receives a comfortable landing and a quick toe-off. The PROFLY™ is a new material from the brand, and it is meant to be more resilient, and have a higher shock attenuation capability compared to other midsole contemporaries from the brand. The upper of the Cavu uses an open-engineered mesh, supplying the foot with lightweight comfort, as well as delivering optimum airflow. The Bondi 6, another Hoka One One running shoe, also utilizes this material in its upper. The mesh also permits a customized fit, as a Lycra® internal lining helps it by providing a seamless layer underneath. This material promotes a second-skin feel and prevents irritation, resulting in a comfortable wear. Aside from the Lycra® liner, another nether element of the Cavu is the internal reinforcements. These details act similarly to overlays, allowing a secure hold and a supportive fit for the foot. The Cavu has a rigid heel counter, which is designed as such so that the foot is guaranteed protection and a locked-down feel.